Fabric is selling its famous Martin Audio speaker system on eBay | What Hi-Fi? The speakers have been playing in Room Two of the famous London club for over 16 years - and now you can buy them on eBay. 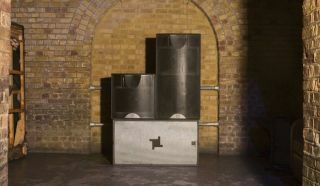 Fabric, one of London's most recognisable nightclubs, is selling its speaker system. Since being installed in 2000, the Martin Audio speakers have played in Room Two of the club for over 16 years - so at least you know they've been well and truly run in. The system is being auctioned on eBay, with 50 per cent of the proceeds going towards a fund for Amanda Moss, the founder of London club, Corsica Studios. Moss has been diagnosed with a rare type of cancer and is trying to raise money for treatment. Thinking of getting your hands on these speakers? At the time of writing - with nine days remaining - the highest bid is £6200. Postage and packing costs may vary, naturally. The package includes eight WSX Wavefront speakers, four Blackline H3T three-way boxes and four Blackline H2 two-way boxes. Perhaps quite understandably, their condition is marked as "used".